Published June 30, 2016 By Anna T. This post may contain affiliate links. Regardless, I only recommend sites I've researched and/or used and trust. 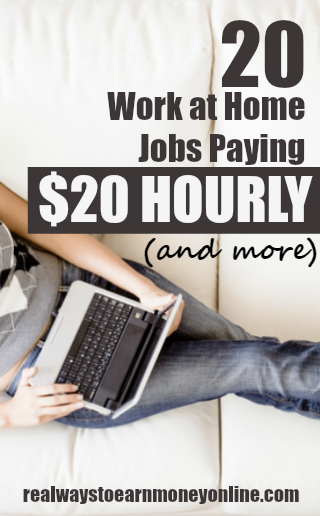 Do you want to work at home making a great deal more than minimum wage? If so, this post should get your wheels turning. I have created a list of several companies that pay their workers $20 an hour or more to work at home. It goes without saying, but when you're talking about this kind of pay, you are almost always talking about companies that are more likely to require a very specific skill set or a college degree. It's very rare to find a work at home job that pays in this range where you need no prior skills or experience to start. And if you don't have the right skills or experience to do the jobs listed below, keep in mind that at least now you know where the money is! So if you're thinking of furthering your education in order to get higher-paying work, you know what industries to possibly focus on. So with that said, let's get on to the opportunities! As always, I cannot guarantee these companies are hiring right now, but if they are on the list, they have hired home-based workers in the past and paid $20 an hour or more. If you have any “formal” or “informal” teaching experience such as mentoring, tutoring, coaching, or alternative education plus a bachelor's degree in the US or Canada under your belt, you may qualify to tutor Chinese children in the English language with VIPKid. This company claims there is potential to earn up to $22 hourly working for them. However, it is independent contractor work so your exact rate will depend on the time you put into it. You can also read our overview of ESL tutoring jobs at VIPKid for more info on how it works. This is a web development company that allows all employees to work remotely. They have occasional openings for web and design engineers, designers, developers, etc. According to Glassdoor, the average salary at this company is anywhere from $53K to $85K, which should work out to over $20 an hour. This company has regular remote openings for editors and also translators. Not all the jobs pay $20 an hour, but as you can see from Glassdoor, many people are reporting making that amount. Their work at home medical coders may earn around $25 hourly, according to Glassdoor. One year prior experience and certification is required. Work remotely for A Pass Educational group as an educational subject matter expert. These positions appear to pay between $20 and $30 an hour. This company, which specializes in web and app development, is often looking for developers with great coding skills to add to their team. Everyone works at home. Pay is over $20 an hour, with some positions paying $30+ an hour. This company often has remote positions listed that usually pay over $20 an hour, some are listed at $50 an hour. The positions come and go, so you'll have to keep tabs on the site to see when they are open. They are often looking for editors, proofreaders, book jacket designers, etc. Buffer provides web-based social media management solutions. They allow all their workers to work remotely, and they provide transparent salary information. From this, you can see that the vast majority of their workers are likely making over $20 an hour. They hire for many different positions on occasion, from techy developer and engineering jobs to product/customer support. This company hires work at home registered nurses for telephone triage. Pay is around $25 an hour. Chegg pays their online tutors a starting rate of $20 an hour. It's a flexible, work anytime job that pays weekly. It appears that most of their tutors do the work part-time because it says on the site that the average amount earned by their tutors is $1,000 monthly. You can read our overview of tutoring jobs at Chegg for more info on how it works. Keep tabs on this company's careers page for the “Clinical Care Coach” position. It's work at home, and pays $20 an hour. RN or higher license is required. This company has regular openings for medical writers in different locations nationwide, paying between $60K and $100K per Glassdoor. Unfortunately, the job is partially location-based, but they do allow for you to work at home some throughout the week. Github is a software company that allows many of its employees to work remotely. They have regular openings for techy positions like developers, engineers, etc. as well as some customer support positions. Per Glassdoor, most Github positions provide a salary of over $60K per year. They have openings for remote video medical interpreters on occasion. This is flexible work paying $1 per minute. Although I could not find any salary averages for this company on Glassdoor, it seems that $20 an hour may be possible. This is an interpretation/translation company that, per Glassdoor, does appear to pay their translators and interpreters in the neighborhood of $20 an hour, although some other listed positions don't pay that much. They regularly hire remote test prep experts who help out students with questions regarding the GRE, GMAT, SAT, ACT, and TOEFL tests. It's a contract position paying $20 hourly on weekdays and $25 hourly on weekends. Must have a BA or BS, a high score on the SAT, GRE, or GMAT, and teaching or tutoring experience. You may be able to work as an instructor for Manhattan Prep and earn $100 an hour. The company is highly selective and not all jobs are remote. If you have medical coding experience, you may be able to work at home for Precyse, earning in the neighborhood of $25 to $30 hourly. This is an education company that provides online tutoring/teaching services to students in grades 6-12. They pay their work at home professional tutors $20 an hour. Prior teaching experience is required and a bachelor's degree is preferred. This company provides a service for landlords and property mangers to help streamline the scheduling and showing process for rentals. They currently have three remote positions listed (although what's listed will vary) for call center manager, automation expert, and sales manager, and all of these positions pay $20 an hour or more. And there you have it! I'd love to add some more companies to this list if you want to help me out and comment below with the names of companies you're familiar with that pay $20 an hour or more to work at home. If you're finding that you're not qualified for most of the positions above, I also have a list with work at home jobs paying $10 hourly and work at home jobs paying $12 hourly that you may want to browse for more options. I promote a number of work at home jobs or assignments that I believe can generate some good incomes. But you must do your diligence to visit each of the websites and read up their offers, to be convinced they are worth the investment. Though there are millions of scams on the internet, there are still a few genuine ones. Sometimes, one may need to take necessary risks. Liza, I’d recommend checking here first – http://realwaystoearnmoneyonline.com/work-at-home-job-leads That’s the list I keep of companies hiring currently. Good luck to you! Anna, could you please assist me with any online job suitable especially for Nigerians? I’ve spent lot of time searching online but i couldn’t find any for Africa generally and Nigeria in particular. I’m a graduate and i need job so i can further my education and also make a good living for myself. Thank you. I do post about some things that are open worldwide. I’ve applied for Book in a Box, but it was a great experience. They didn’t leave me wondering where my I was in the process for weeks on end. Also, I’m on their list for when other things come up. I’m working on “me” so that I can make a career move into something that I enjoy and be paid what I’m worth! Where are the work from home accounting jobs??? They never make the list. Do they not exist? I desperately need a work from home based job. I live in Saudi and have seen most of the online jobs does not fall in this region. I have a bachelors degree in business administration. Having a hard time finding one! Can anyone help me find one? I currently work at home as a remote guru for Shopify. They hire remote gurus in Canada (BC, Ontario, New Brunswick and Quebec) and also Galway, Ireland. Starting salary is about $19.25 per hour. do they hire in the US? I live in WV. I have applied for at least 3-4 of these and they require experience as well. I have a masters degree in HR and have took IT classes but couldn’t get past the application. I have been 0 for 4 because my experience is in telecommunications (something I am trying to get away from because of the policies). If anyone has tips let me know. It is heartbreaking to go to school and get ‘typecast’ into a job. I know exactly what you mean! I’ll keep my eyes open for you!